In this competitive world, every business needs dynamic website which can give the proper details to the customers, keep them informed about the changes in the products and prices and their new offers. A dynamic CMS website should reflect all the changes on the business website and such websites are easy to use. The powerful and smart CMS should be chosen to build dynamic websites. A content management system is a computer system that allows publishing, editing and modifying content as well as site maintenance from a central page. Being a fast and flexible system, CMS has user-friendly approach. Data can be defined as documents, movies, text, news, blogs, forums, pictures, phone numbers, scientific data and so on. A major advantage of using CMS is that it requires almost no technical skill. It is not necessary to be an HTML expert for using CMS. Even a layman can edit his or her website using creative CMS. Joomla is a most powerful open source content management system which enables you to build remarkable Websites and powerful online applications. Joomla Framework is coded in PHP Programming. It uses WYSIWYG (What-You-See-Is-What-You-Get) editor for the creation of content. This editor allows modify online content. Hence, there is no need to know any HTML code for modifying content. 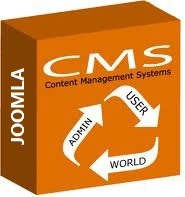 Why Choose Joomla for CMS Website? Joomla has better features than most other CMS for Websites. Joomla software can be downloaded by anyone free of cost. To enhance the accessibility of Website, Joomla provides multi-lingual support. More than 7000 extensions are available, of which many are free of cost. Joomla provides plug-ins to extend the functionality of the website. For example: Event calendars, newsletters, shopping carts, etc. can be added. Joomla templates can be downloaded and can be used for Websites. WYSIWYG editor is its tool that helps even the layman to edit the content. It provides Document management for creating, revising and publishing the content. It facilitates E-commerce system to sell the user’s products & services on Joomla CMS website. Joomla updates the new features regularly. It makes SEO friendly CMS. Its interactive components allows the visitors to interact, such as in discussion forums, comments, online polls, etc. With minimal training, the client can login and update the content from anywhere in the world. Joomla has gained most of its popularity due to the reason that new modules can be formed by writing codes. Anyone can do this task of writing codes and the visual look of the website can be enhanced. Educational institutions and many more. One need not to worry if he has any problem while using Joomla. There are support forums that help the people for getting a solution to the problem. Joomla provides an extra security through membership management that has control over the access of different components. Joomla web applications can be used easily by the users and its simplicity has increased its number of users. ZenGo! Web Services offer resourceful yet intuitive solutions which can get started by just a single click can install the application on the user’s computer. If are you interested for Joomla CMS design? Then please go to our contact page and shoot us an email. ← Previous Previous post: vTiger Vs SugarCRM – Which One is the Best CRM for YOU!